On Friday we have our school photos so please ensure your child has their correct uniform on including shoes. 100th Anniversary of the signing of the Armistice and the end of WWI. After four terrible years, the First World War finally came to a close with the signing of an armistice between Germany and the Allied Powers on 11 November 1918. On the 11th hour of the 11th day of the 11th month, the guns famously fell silent. New Zealanders celebrated enthusiastically, despite having recently celebrated the surrenders of the three other Central Powers – Bulgaria, Turkey and Austria-Hungary – and the premature news of an armistice with Germany. Congratulations to Santino for his selection in the U12 Boys Manawatu touch team. Orders online only for issue 8 will open on 19th November. The brochure can be viewed online. Credit card only payment for these orders. No. 8 will close on 6th December. These are being taken this Friday starting at 9am. School will be closed for instruction that day. 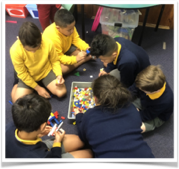 We are taking all our students in their whanau groups down to the Wellington Zoo by bus to round off our animal inquiry study this term. Three groups will go on December 13 and three on December 14. This way families will all be going on the same day and we will have the older students to help look after the younger ones. Thank you to those adults who have offered to help with supervision. We now have enough thank you. If the weather allows we will start with a picnic tea out on the field followed by carols. Each class will be singing a carol and we invite cultural groups to organise and sing one as well. If wet this will be held in the hall. Small jersey. Unnamed and being held in the school office. Your child’s Animal Inquiry art can be made into affordable Calendars, cards, Diaries, Sketch Books and Mousemats. These make unique Christmas gifts for family and friends. More details can be found in the order form coming home with this newsletter. Sample products can be viewed on the table outside the school office. Ordering and payment deadline are the 22nd November with the product due to arrive the week of 17th December. Order forms coming home this Friday 9th November with your youngest child at school. Every Thursday (during term time) 9.30a.m. at St James School Hall. Music session followed by morning tea. Everyone is most welcome! Please contact Steph on 0274408544 for more info. A Parish Secretary is required for St Brigids Feilding. The position is for up to 25 hours per week. Full details are on the noticeboard in the Church Gathering area. November is Mass count month. It’s an annual statistical snapshot of participation at Sunday Mass. The statistics are not just about numbers; they are about us and our faith. Last year our numbers were up. That was a good news story. A significant part of that trend is the wonderful co-operation between DRSs, Principals, Children’s Liturgy Leaders, and Priests. No one believes faith is unimportant. And in our hearts we know the best way to keep our faith growing and vibrant is coming along to Mass or Miha. Mass makes not just Sunday special but the whole week, as it brings purpose to our lives. Especially to those of you who maybe have not been to Mass for a while, I encourage you to feel at home at Church. It’s our place. See you Sundays! Bishop Charles. 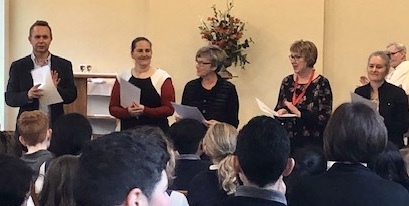 The teaching staff were presented with their certificates in Religious Education at the end of mass on All Saints Day. Superheroes practising relays for Athletics.